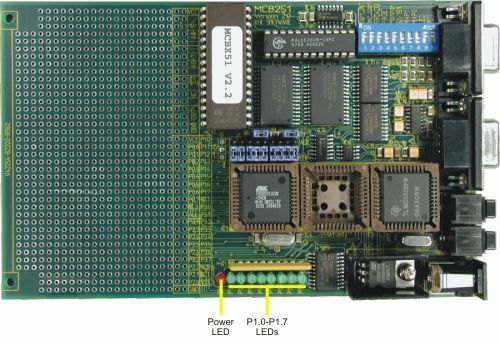 P1.0 - P1.7 connect to eight Port 1 pins when DIP Switch 9 is ON, and may display program status while testing your applications. Setting the DIP Switch to OFF disables the LED drivers. The Port 1 LEDs flash during reset and display the configuration status of the Monitor EPROM. When this DIP switch is OFF, the Monitor does not affect the Port 1 pins during the reset phase.